"This is an absolutely critical must–read for financial services executives. It′s the only book of its kind that provides a granular ′how–to′ guide to managing our businesses in the new regulatory environment. An excellent read!" Norman R. Sorensen, President and CEO, Principal International, Inc.
Part One Understanding the Immediate Political Reactions. Chapter 1 Immediate U.S. Reaction The Emergency Economic Stabilization Act of 2008. All Roads Ultimately Lead to Congress. How a Crisis Bill Becomes an Emergency Law. Chapter 2 Rise of the G20 – A Global Call to Action. A New International Financial Order. Chapter 3 The Beginnings of the New Regulatory Reality. Democracy Can Act Swiftly in a Crisis. Problems at a Small Minority of Firms Create Lasting Industry Problems. Populist Anger Drives Unintended Consequences. When Governments Intervene to Protect Taxpayers, Strings Are Attached. Crises Have Long Political and Regulatory Tails. Safety Valves Don′t Always Work as Expected. International Crises Command Global Responses. Part Two: Understanding U.S. and G20 Regulatory Reforms. Chapter 4 The U.S. Legislative Process. Chapter 5 The Dodd–Frank Act of 2010. Chapter 6 Beyond the U.S. – Current G20 Efforts. IMF Review of U.S. Financial Sector Assessment Program, 2010. Part Three Preparedness: 10 Lessons for Winning in the New Regulatory Reality. Chapter 7 Set the Right Leadership Tone at the Top. Chapter 8 Tell a Good Story. What Individual Firms Can Do. What the Industry Must Do. Chapter 9 Be Politically Adept, Not Tone Deaf. New Legislative Mandates for Executive Compensation Limits. Chapter 10 Advocate Constructively for Better Outcomes. No Shortage of Future Policy Debates. The Importance of Balanced Policy Objectives. Broader Issues: Getting Back to Competitiveness. Chapter 11 Manage Strategy and Regulatory Risks Together. 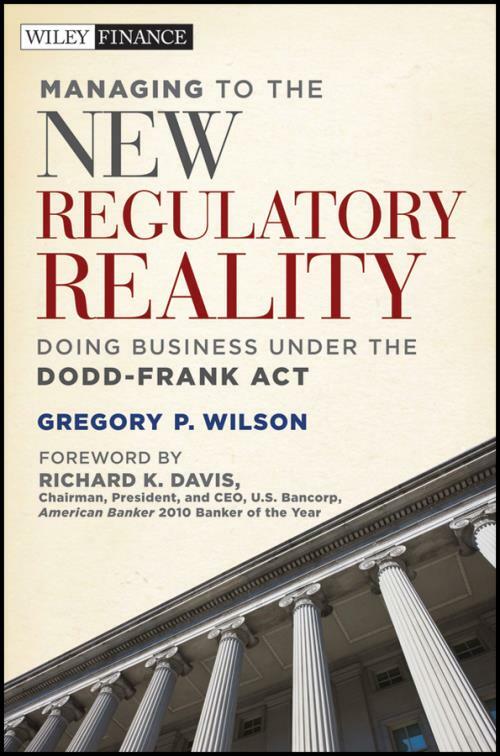 Strategy and Regulatory Risks after the Dodd–Frank Act. Chapter 12 Maintain Fortress Strength at all Times. New Capital and Liquidity Requirements in the Dodd–Frank Act. Chapter 13 Live Good Governance. The Value of Good Governance. Recent Regulatory Efforts to Improve Corporate Governance. Chapter 14 Plan Carefully for Contingencies. Chapter 15 Engage Regulators on Warning Signs. Making sense of crises warning signs. The New Official U.S. Role in Identifying Financial Crises. An Industry Action Plan on Early Crisis Detection. Chapter 16 Build Trust–based Supervisory Relationships. Improve Supervisory Relationships to Avoid Negative Regulatory Consequences. Chapter 17 Conclusion – Be Prepared! Implications for the Financial Services Industry.